Brent was born in Dunedin and admits to being over 60 years old! He has had a long interest in boating, starting with water skiing on the southern lakes at an early age. Brent trained and qualified as an electrician and spent over 11 years in that trade before several years working in the electronic security field. Since joining Vining Shipbrokers in 1991 Brent has successfully sold yachts and launches throughout New Zealand. Brent has owned and sailed yachts for over 35 years and has been involved with club racing and cruising around Banks Peninsula and the Marlborough Sounds. He served on the Committee of the Banks Peninsula Cruising Club (now part of Naval Point Club) in Lyttelton. He also has served as Rear Commodore Sailing with the Waikawa Boating Club which involved running the sailing calendar and arranging sponsorship from numerous local businesses. Brent's most memorable cruise was sailing an H28 from his then home port of Lyttelton to Stewart Island and exploring all the rivers and inlets on the eastern side of the island before sailing back to Lyttelton. An important event during his brokerage career was selling a yacht to a couple new to boating. Brent taught them to sail and race and they became good friends. Later Brent sold them a cruising yacht and sailed with them to Vanuatu, the first leg of a world circumnavigation for both the yacht and crew. Brent's personal boating has had a change of focus in the last few years and his present vessel is a Vindex 32' launch which he finds more suitable for the Sounds and fishing in Cook Strait. In his spare time away from the water, Brent has three classic cars and takes great pleasure maintaining and driving them on tours around New Zealand. Brent is keen to share his extensive boating knowledge to assist anyone considering buying or selling boats. After three years in the Navy as a marine engineer Gavin left New Zealand to go sailing around the Pacific and Australia for a year. On returning to New Zealand Gavin went back to marine school and obtained his Commercial Launch Master's ticket and made a living driving water taxis, ferries, tugs and delivering various vessels around New Zealand, Australia and the Pacific. After more study and obtaining his New Zealand Offshore Master's qualification, Gavin spent a period teaching Commercial Launch Masters and Coastal Masters at Maritime School before returning to delivering boats again. This took Gavin to the Caribbean, South and Central America and on to the USA and Canada. On returning to New Zealand Gavin and his partner Sarah worked as tender drivers for the super yacht fleet at the America's Cup In Auckland. A chance meeting with the owner of a 90' Ron Holland yacht who was looking for a skipper and cook to sail himself and his guests through the Pacific to Hawaii was the opportunity for Gavin and Sarah to get into the white boat industry. This led to deliveries to Asia and on to the Mediterranean where, for three years, Gavin was fortunate to skipper yachts including a classic 72' Herreshoff schooner, a 70' Swan and a number of large motor vessels. Returning again to New Zealand, Gavin and Sarah were involved with the last America's Cup in Auckland before returning to Picton to start a family and enjoy the Marlborough lifestyle. Being a broker for the last six years with Vining Shipbrokers has given Gavin the pleasure of meeting both experienced and novice boat owners. Whether buying, selling or just making an enquiry Gavin is happy to discuss your requirements. Pip has a lifetime of boating experience, starting at a young age he sailed a P Class moving through to the Cherub later on. From there Pip moved into Keeler Sailing, he occasionally purchased yachts in Auckland taking them south to Banks Peninsula for renovation and refurbishment before cruising to the Pacific Islands for some rest and relaxation. Pip completed an Auckland to Suva race followed by a position skippering a 50ft yacht from Lyttelton to Tahiti. Pip moved to Picton 12 years ago together with his wife Jill and their two sons. Prior to joining Vining Shipbrokers he was working as a boat builder at Jorgensen's Boatyard working mainly on traditional timber vessels. Living in the Sounds prompted Pip to change from yachts to launches including a 47ft Charter Launch. Pip is happy to use his experience with different types of boats to help clients find the boat best suited to their needs. Brett and his wife Lisa moved to Picton from Auckland in late 2016 as a lifestyle move to enjoy the great boating opportunities in the Marlborough Sounds and to escape the Auckland traffic. Brett has had 50 years boating experience from small boat racing to crewing on RNZYS championship winning TP52 - V5. Overseas racing experience includes the Hamilton Island race week, fleet racing in Lisbon Portugal and in 2005 competed in the TransAtlantic Challenge aboard the 100ft maxi racer Maximus. Brett and Lisa now enjoy a more relaxed sailing lifestyle in their 35ft cruising yacht. After a 40 year broadcasting career with TVNZ as a journalist, documentary maker, and executive producer, Brett moved to the corporate world as KPMG’s New Zealand communications manager for four years. He’s now joined the Vining Marine team in Picton to share his boating and business skills to help clients achieve their boating dreams. Brett is happy to meet and talk to all boaties about their boating requirements. Gavin grew up by the sea in Devon, UK enjoying all things boating, especially sailing. Teenage years were spent racing dinghies and later yachts along the South coast and across the English Channel. After University, Gavin did a stint as a charter skipper in Scotland working on converted traditional gaff-rigged working boats before settling in Bristol to start a family. Then, in search of adventure, Gavin and his family moved out to New Zealand to live in Wanaka where we stayed for 17 years. During the years in Wanaka, Gavin was an active member of the Wanaka Yacht Club serving on the committee, teaching youngsters to sail and racing my Flying Fifteen. Now, after several summers in the sounds, Gavin has moved to Waikawa to join Vinings and looking forward to helping other people find their perfect vessel with which to pursue their chosen boating activities whatever they may be! Mark was born and raised in Zimbabwe where he started racing dinghies at the age of 12, progressing through the Laser, OK, Finn and Fireball classes culminating in winning the National “O Class” Championship at the age of 16. He moved to the South Coast in the UK where he spent many years racing Fireball’s and occasionally crewing in various larger yachts for friends, all whilst pursuing a career in financial services as a Qualified Financial Adviser. Always searching for sea and sunshine, Mark moved with his family to Nelson and continued his financial services career with a local bank but in 2016 he followed his heart, resigned from the bank, bought a 38 ft Fortuna ‘Island Spirit’ catamaran and sailed from the Bay of Islands around the east coast of NZ to Nelson, where he has enjoyed sailing around the Abel Tasman, Nelson Bays and the Marlborough Sounds. He has also enjoyed racing locally in a Marauder 27 with the TBCC. After 18 months living aboard he realised that he no longer desired to continue his career in financial services, so decided to follow his real passion for boating and joined the Vining Marine team in Nelson. Peter McGrouther is based in Dunedin, lives with Korena, and growing crew Andie Grace and Jessie Rose. He started sailing in optimists, moths, Javelins, Finns, Noelex 22s then started coastal trips, Stewart Island to Dunedin. Korena and Pete brought Sapphire a 32 foot Keith Eade design keeler and cruised Stewart Islands east coast for a couple of Xmas Holidays and now own Harlequin a Wilson 36 keeler which they cruise and race locally. Korena and Pete are both qualified to Ocean Yachtmaster and have sailed several deliveries up and down the coast from Nelson to Stewart Island. In 2000 they joined Island Cruising association and helped deliver a 40 foot Ron Holland yacht from Auckland to Tonga and a couple of years ago they met with friends in Tonga to help deliver their 50 foot Ron Given Cat to Fiji then to New Caledonia. Boating is Peters hobby and passion, he enjoys helping people find their dream boat and also helping others sell to realise other dreams. Born in Christchurch (some many years ago) I was brought up in Pigeon Bay and Governors Bay where I learnt to sail in keel boats. Early memories include family holidays sailing around Banks Peninsula between Lyttleton and Akaroa. During the late 1980s and 1990s I raced actively as a member of the Banks Peninsula Cruising Club as a crew member and then as the co-owner of the Ross 35 Innocent Man. Competing in club and Coastal races as well as representing Canterbury in Women's Keel Boat racing and Match Racing. I held the positions of Rear Commodore and Vice Commodore of the Banks Peninsula Cruising Club up until the amalgamation with the CYMBC and the start of the Naval Point Club. After losing Innocent Man in the marina during the October 2000 storm I became the co-owner of the Farr 44 Cuttyhunk. With partner Chris Platt I skippered and raced Cuttyhunk coastally including the 2003 Auckland - Musket Cove, Fiji Race. In 2007 we sailed her to Valencia, Spain to watch the Americas Cup. Our route took us across the Pacific to Easter Is., the Galapagos, Panama Canal, Bahamas, Bermuda, and Azores. We continued to cruise part time in the Mediterranean until 2010 when we became "live aboards" in Turkey. Over the next 2.5 years we made our way back across the Med, the Atlantic and the Pacific returning to New Zealand at the end of 2012. I hold New Zealand Yachtmaster, RYA Off Shore Yachtmaster commercially endorsed and RYA Oceanmaster (theory) qualifications. I have been self employed for most of my working career. As co-owner of Neat Furniture in Christchurch for over 20 years and now as owner operator of Canterbury Trails, a tour company specializing in personally guided tours of the South Island for overseas visitors. No longer a boat owner ( temporarily) having sold Cuttyhunk through Vinings in 2013 I am looking forward to being part of the Vinings team, this way I can still get a sailing or boating "fix" until the next sailing adventure presents itself. Steve's association with the sea and boats charts back to his childhood racing dinghies in Auckland followed by a circumnavigation in the family yacht. A journalist by profession, Steve has gone on to complete many trans-ocean passages amassing 70,000 offshore miles in racing and cruising yachts. Steve holds a Yachting NZ Cruising Award for Outstanding Services to Yachting and brings a wealth of experience and knowledge equipping and preparing yachts for cruising and racing. He currently lives aboard his own yacht with his partner Cherie in Auckland. Ian began his involvement in boating while working as a firefighter in Christchurch in the 1980s, where he and his family spent off-duty time firstly in a Dancer trailer-sailer and progressing to a Farr 6000 and then to his favourite trailer yacht a Noelex 25 - Ian has now owned 5 of these! Through the 1980s and 1990s, Ian served on the Committee of the Canterbury Trailer Yacht Squadron rising to Vice Commodore and enjoyed arranging events and functions. At this time he also owned Sea Breeze Marine Brokers in Christchurch selling trailer yachts all round New Zealand. Leaving the Fire Service in 1995, the Michel family moved to Picton where Ian became Manager of the Waikawa Boating Club. He particularly enjoyed racing and cruising around the Marlborough Sounds aboard their Mull 31 "Verdict" and later the Farr 1020 "Rainbow IV". Ian left Marlborough in 2000 and moved to Tauranga where he purchased Tauranga Boat Sales having initially worked there as a broker. Ian sold that business in 2007 and worked for the new owner for 12 months before he and Mike Vining purchased Vining Shipbrokers in April 2009. These days Ian races and cruises his Beneteau First 40.7 in Waikawa Boating Club events winning Div 4 in the 2018 Lawsons Dry Hills Regatta. Away from things boating, Ian enjoys gardening, reading, photography, 60s and 70s music and doing things with his (Adult) children! Ian Purchased Mike and Cindy Vinings Shares in Vining Marine in April 2016 and is now the sole owner of the business. After spending 30 years in the computer software industry both in New Zealand and Australia Trevor retired to Waikawa with his wife Linda in 2004. Waikawa had been a favorite scuba diving and sailing holiday destination for them for many years. While in Waikawa Trevor obtained his Local Launch Operators ticket, put his yacht into Safe Ship Management and started a business "Sounds Sail" doing skippered charters in Queen Charlotte Sound and delivering boats around New Zealand. 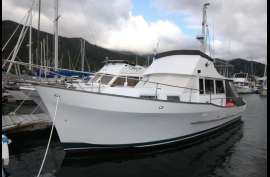 Trevor & Linda spent 2008 cruising New Zealand's North island in both their yacht "Snafu Too" and their camper van before returning to Waikawa in mid 2009 and resuming in the position of computer admin at Vinings.